where Brij is the amount of bribes paid out by firm i in country j, X is a vector of country level attributes representing culture, legal systems, and institutional capacity; c is a vector of firm level characteristics representing Control Rights; b is a vector of firm level characteristics representing Bargaining Power; g is a vector of firm level characteristics representing Grease the Wheels; and z is a vector of other firm characteristics (unrelated to the three hypotheses) that might also lead to bribe paying. The first set of vectors is macro-level while the second set is focused at the firm level. where BD is a dummy variable equal to one if the firm reports paying a bribe, and zero otherwise. The dependent variable comes from several questions in the Enterprise Surveys which ask the respondent whether a "gift or informal payment" was expected or requested with regard to customs, taxes, licenses, regulation, public services, etc. In addition to the dependent dummy variable, the other firm level variables also come from the Enterprise Surveys. The World Bank Enterprise Surveys provide a cross-sectional survey of industrial and service enterprises, with the data used in this analysis focusing on the Africa region between the years of 2006 and 2014. Data collection efforts were led by theWorld Bank, which has been administering business environment surveys since the mid 1990s. The surveys focus on the manufacturing and services sectors and 100% state owned enterprises are not allowed to participate. Important for the purposes of this paper, the surveys also do not include data from firms operating in extractive industries like oil or minerals. The surveys are administered through face-to-face interviews with business owners and top managers (World Bank, 2014). The firm level vectors use variables that I created from responses to the Enterprise Surveys. The Control Rights vector is represented by the Government Help dummy variable, which is equal to one if a firm requested any public services in the past two years. According to the theory above, requesting government help is expected to have a positive relationship with bribe paying. The Bargaining Rights vector is represented by two dummy variables: Access to Credit and Credit Constrained. Access to Credit is used to gauge a firm's solvency, and is equal to one when firms have access to a line of credit or overdraft facility. Credit Constrained is used to gauge how difficult it would be for a firm to pick up and move to a less corrupt market, and is equal to one when firms have a) applied for a loan and been rejected, or b) not applied for a loan for reasons other than "does not need a loan." Both of these firm traits are expected to have a positive relationship with bribe paying. Grease the Wheels is measured through two dummy variables: Trust in Courts and Competition. Trust in Courts measures firms' belief in the effectiveness of government regulation and bureaucracy, and is equal to one when respondents said they believed the judicial system worked fairly and impartially. Competition measures the business environment in which firms are operating, and is equal to one if firms reported reducing prices due to competition against another firm. Trust in Courts is expected to have a negative relationship with bribe paying and Competition is expected to have a positive relationship as firms make decisions to gain an advantage over their competitors. I also created a Foreign dummy variable which equals one if the firm has any foreign ownership. This last variable will provide some insight to the impact of foreign firms on corruption in Africa but data limitations prevent us from separating Indian and Chinese firms from the rest. Other firm level variables include Registered (=1 if the firm was officialy registered when it began operations), Government Owned (=1 if any government ownership), Medium (=1 if the firm has 20-99 employees), Large (=1 if the firm has greater than 100 employees), Young (=1 if the firm has operated for less than 20 years), Old (=1 if the firm has operated for more than 50 years), Sales (the log of last year's sales), and Trade (=1 if the firm imported or exported any goods). Chen, et al. (2008) includes several macro-level variables, but I decided to focus on the two in particular that I felt were of the most importance to this paper. The first is a British Legal Origin dummy variable, which I adapted from a list of countries with British legal origins found in Klerman, et al (2012). For the African continent, this includes Ghana, Tanzania, Malawi, Uganda, Gambia, Zambia, Nigeria, Kenya, Mauritius, Lesotho, South Africa, and Zimbabwe. The second is an IndoChina dummy variable, which I set equal to 1 for African countries that have developed strong investment and trade relationships with India and China (Broadman, 2008; DahmanSa˜adi, 2013; Leung and Zhou, 2014; Nayyar and Aggarwal, 2014, 2). Countries coded for the IndoChina dummy are South Africa, Nigeria, Zambia, Algeria, Sudan, DRC, Ethiopia, Mauritius, Tanzania, Madagascar, Guinea, Kenya, Mozambique, Senegal, and Uganda. If Indian and Chinese firms have in fact exported their bribery-heavy management practices to these countries, this variable should be positively related to corruption. To further disaggregate this potential result, I also created an interaction term called IndoChina x Foreign to see the effect of being a foreign firm operating in a country with a strong IndoChina presence. If the claims of Indian and Chinese corruption are to be believed, this term should bear a strong positive relationship to bribe paying. Within this particular mix of variables, there is the potential that some micro and macro variables could fall under each of the vectors on the right-hand side of equations (1) and (2). To ensure a proper model and avoid incorrect inferences due to multicollinearity, I constructed a correlation matrix (See Appendix Table 1) for all independent variables in the dataset. I then dropped variables with particularly high correlations (>.50) that could create multicollinearity issues. For example, I did not include IndoChina and British Legal Origin in the same specification, although it would have been interesting to see the effect of controlling for legal origin on the IndoChina coefficient. The summary statistics for these variables are included in Table 1. For the sake of brevity, I will not go into detail regarding the estimation procedure, but the basics are as follows: I used a probit regression model to account for the binary choice faced by firms in determining the dependent variable (they either pay bribes or they do not). Because the coefficients from probit regressions are relatively meaningless on their own, I also ran separate regressions to estimate the marginal effect of each independent variable on bribe paying. This marginal effect coefficient will show the change in the conditional probability that firms will pay bribes if they fall within a particular group (change in Pr(BD=1 — var=1)). The probit regression coefficient results are included in the Appendix (Appendix Table 2) and the marginal effect coefficient results are shown below in Table 2. 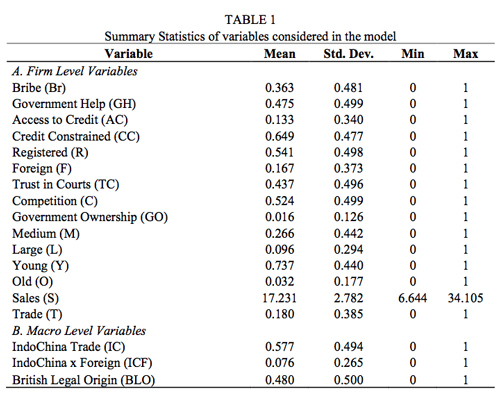 As Table 2 clearly illustrates, the majority of the variables selected for the regression demonstrate a significant relationship with a firm's decision to engage in bribe paying. Beginning with the three hypotheses Control Rights, Bargaining Power, and Grease the Wheels I find evidence in support of each theory. 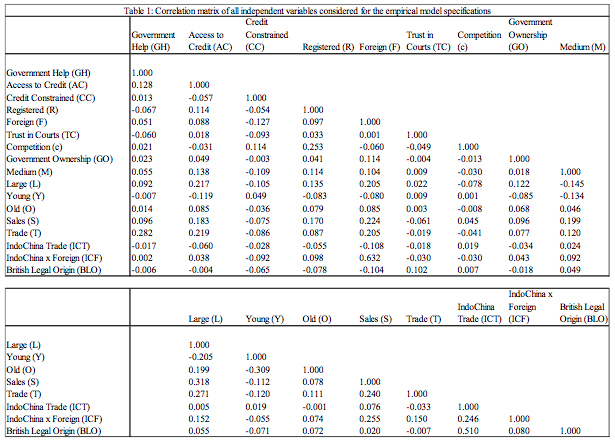 Looking at the marginal effects presented in Table 2, we find that ceteris paribus, Government Help increased the probability of bribe paying by 12%, Access to Credit increased the probability by 4%, Credit Constrained increased the probability by 2%, Trust in Courts reduced the probability by 10%, and Competition increased the probability by 7% (contrary to the belief that competition drives out corruption, bribe paying might lead to a needed competitive advantage). 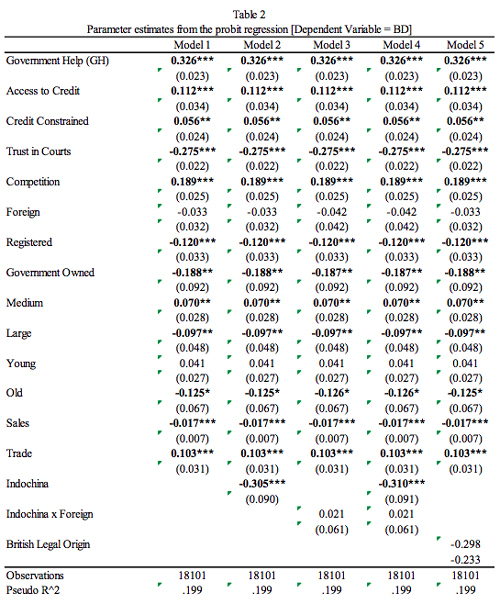 Each of these marginal effects and the original coefficients from the probit regressions (See Appendix Table 2) carries the expected sign and shows that bribe paying in Africa is indeed a function of the institutional investment climate as much as it is a supplyside management decision. Importantly, the Foreign dummy does not have significance in any of the models, but if it did, it would have a negative marginal effect on bribe paying. This might prove the effectiveness of Western led anti-corruption legislation, or could also be attributed to other explanations such as greater bargaining power held by foreign firms or less knowledge of domestic business practices where bribery is in fact the norm. With the exception of the Young dummy variable, each of the other firm level control variables also showed robust significance. Registered firms, Government Owned firms, Large firms, Old firms, and firms with more sales all proved less likely to engage in bribe paying. While Government Owned firms might have less reporting of bribe incidence, this trend among the other groups is most likely due to the better bargaining position that these firms have against public officials requesting bribes. As more established entities with greater resources, they are more empowered to report and seek legal action against corrupt public officials. Moving on to the macro level variables, I find an extremely interesting result. Firms operating in countries with high levels of Indian and Chinese investment and trade activity are 32% less likely to engage in bribery. That number is remarkable, considering that Government Help demonstrated the next highest marginal effect at 10%. Of course, this result does not necessarily indicate that Indian and Chinese firms contribute to a less corrupt business environment. A far more likely explanation is that countries that attract FDI and trade have inherently better investment climates that are already relatively corruption free. However, some of the countries included in the IndoChina group such as the DRC, Nigeria, and Sudan (to name a few) are hardly known to for their investor friendly environments. 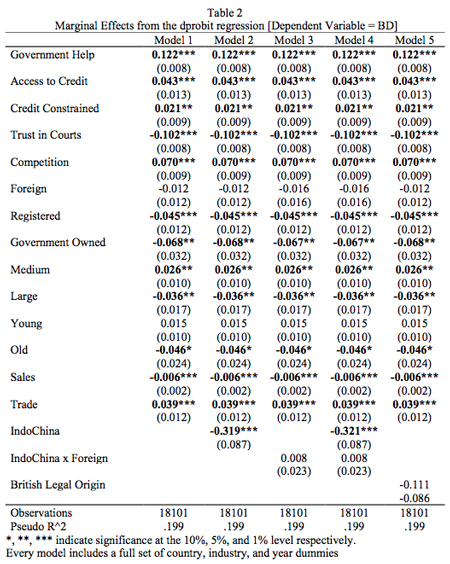 To check these results, Model 5 substitutes the British Legal Origin Dummy (originally excluded because it is highly correlated with IndoChina) and finds that it has a much smaller marginal effect and is not significant at even the 10% level. This result is interesting because the BL dummy should serve as a good proxy of investment climate and rule of law, and even though it is highly correlated with IndoChina, it does not bear the same result. Alaimo, V., & Fajnzylber, P. (2009). Behind the Investment Climate: Back to Basics Determinants of Corruption. In Does the investment climate matter? microeconomic foundations of growth in Latin America. Washington, DC: World Bank ;. Broadman, H. (2008, April 1). China and India Go to Africa. Retrieved December 12, 2014. Cai, H., Fang, H., Xu, L. (2011). Eat, Drink, Firms, Government: An Investigation of Corruption from the Entertainment and Travel Costs of Chinese Firms. Journal of Law and Economics, 54, 55-78. Chen, Y., Ya'ar, M., Rejesus, R. (2008). Factors Influencing the Incidence of Bribery Payouts by Firms: A CrossCountry Analysis. Journal of Business Ethics, 77(2), 231244. For African business, ending corruption is 'priority number one' — Africa Renewal Online. (2010, August 1). Retrieved December 12, 2014, from http://www.un.org/africarenewal/magazine/august2010/african-business-ending-corruption-?prioritynumberone? Klerman, D., Mahoney, P., Spamann, H., Weinstein, M. (2012). Legal Origin or Colonial History? Journal of Legal Analysis, 379-409. Svensson, J. (2003). Who Must Pay Bribes and How Much? Evidence from a Cross Section of Firms. The Quarterly Journal of Economics, 118(1), 207-230. Vanham, P. (2014, November 5). Big dreams of IndiaAfrica trade at Delhi forum. Retrieved December 12, 2014, from http://blogs.ft.com/beyond-brics/2014/11/05/bigdreamsof-india-africa-trade-at-delhi-forum/?